To make aïoli: Mix mayonnaise, garlic and Sriracha sauce together in small bowl. Set aside. Extra aioli can be stored in the refrigerator for up to 3 days. To make burgers: Finely chop chorizo in a food processor or with a large knife. Gently mix together ground pork, chopped chorizo, breadcrumbs, egg, scallions, red pepper, garlic and salt. Shape into 6 patties about 3/4-inch thick. Refrigerate for 10 to 15 minutes. Prepare grill for direct cooking over medium-high heat, about 450°F. Lightly oil grill grate. Grill burgers, with the lid closed, for 5 minutes. Turn burgers, and add pineapple to grill. Finish cooking burger until the internal temperature reads 160°F. on a digital meat thermometer (about 4 to 5 minutes more), turning once or twice, until hot and seared on both sides. Grill pineapple rings until browned on each side. Remove from grill. Toast buns on grill, about 1 minute. 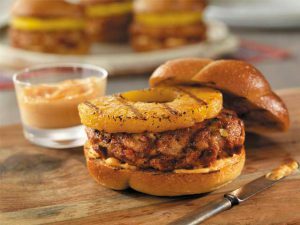 Build burgers on buns with 1 1/2 tablespoons aïoli, 1 pineapple ring, and cilantro leaves to taste. Serve immediately.